This is an adaptation of a classic Shanghai dish, lion’s head meatballs. The name comes from its original format with a hearty pork meatball surrounded by leafy cabbage, or, the “mane.” This casserole-ization maintains the juicy spirit of the dish and simply forms layers out of the three savory stars of the show: rice noodles, cabbage, and of course, the meat. Hao Chi! Preheat the oven to 350°F. In a large mixing bowl, thoroughly combine all the meat mixture ingredients, aside from the crab meat. Fold in the crab meat, trying to keep bigger pieces from falling apart. 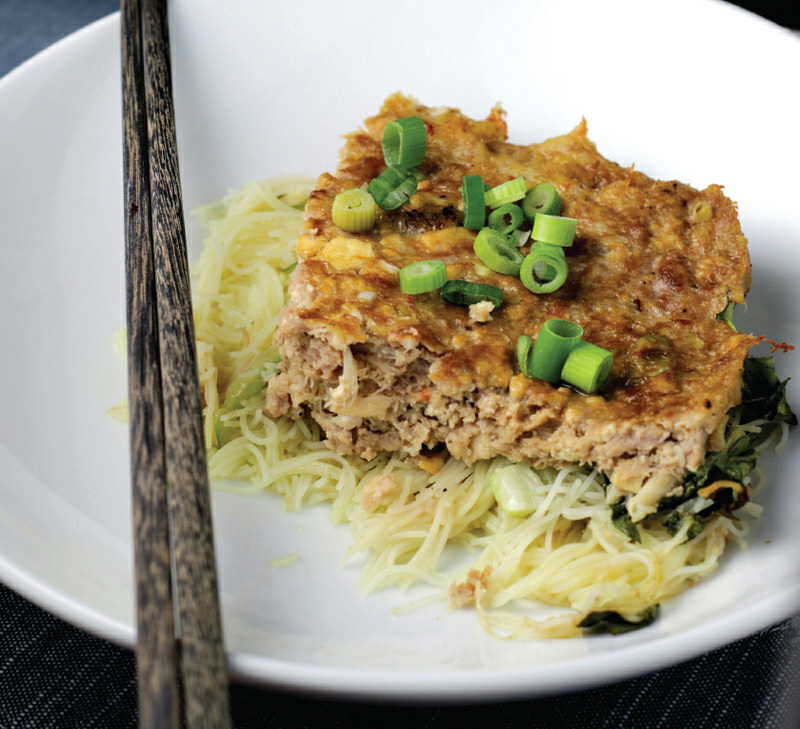 In a baking dish, place the rice noodle segments, and top with an even layer of the cabbage. Gently spread the meat mixture atop the cabbage. It helps to form thin patties of the meat with one’s hands before placing atop the cabbage. Once you mostly cover the cabbage with meat mixture, use a wet hand to smooth the top over and fill in any gaps. BUT, leave a small opening at one corner of the baking dish. Slowly pour warmed-up chicken broth into the corner opening, being sure not to disturb the meat layer. Then, carefully close the gap, pushing some of the meat mixture to close it up. Transfer the baking dish into the oven and roast for 35 minutes. Remove the casserole from the oven, top with scallions, and serve hot, being sure to include some meat, cabbage, and noodles with each serving.